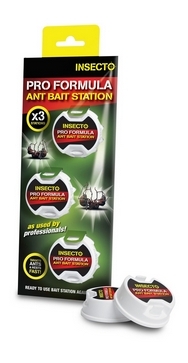 Pack of 3 Max Force LN Ant Gel Bait Station is for use to kill, stop and get rid of black ants. Max Force LN Ant Gel Bait Station comes complete with an ant bait gel which the black ants carry back to their colony which then kills off the ants nest. The bait is made of honey, sugar and the active ingredient imidacloprid which attracts black ants to take up this ant poison. Max Force LN Ant Gel Bait Stations keep the ant poison safe where children or pets are present.